Copenhagen is no megacity with millions of inhabitants, yet even with the one million they have they’re on the radar of the gourmands and foodies of the world with their excellent restaurants – from expensive to lesser known and cheaper, but not worse whatsoever. With their one million they’re many, many steps ahead. And it all starts with breakfast. The little brother or sister of Noma restaurant, pretty decent in their prices and absolutely excellent in their flavours. A side dish to the famous Restaurant 108 just around the corner, where the locals pop in all day long for a cup of coffee or a hot barley drink (their version of a hot chocolate), grab a delicate pastry to take away for breakfast (the coffee mille-feuille à la croissant is a must-have) or have a seemingly so simple but so uniquely magnificent bread with whipped butter and cheese. At lunch and actually all day long wine lovers gravitate here to sit down with a glass of great wine (from small and obscure, biodynamic, organic and simply superb winemakers) and a snack plate or a salad, often stretching that enjoyment into the night as well. Freshly baked croissants – classic or with ham and cheese, and then an almond one, bursting with almonds. Waitresses speaking French among themselves, delicious coffee and fantastic bread. No, this is not a bakery, it’s a small restaurant. One of the gems of Nørrebro neighbourhood – you always have to book a table ahead, but if you haven’t done that, join the queue and watch people eating, it’s worth it. For breakfast everything here is great – from the porridge (with butter, jam and berries) to eggs Benedict, oeuf en cocotte and granola. By lunchtime the menu takes on a more Italian character, and the same goes for dinner. And, by the way, in the summer they have fabulous ice cream, vending it out on the street. The hazelnut ice cream with olive oil and sea salt – it’s out of this world! 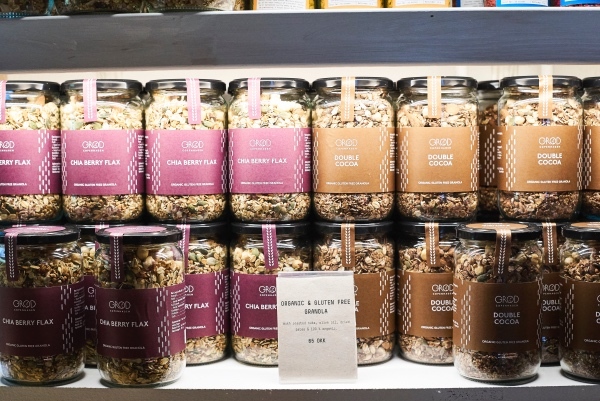 Grød is all about grain – from oatmeal and gluten-free flakes for breakfast to barley, rice and all kinds of cereals for all meals up to dinner. If you’d like to start with everything on one plate, the all-in-one breakfast porridge will be the best choice – a base of your choice plus caramel, peanut butter, Valrhona chocolate drops, almonds, hazelnuts, granola, berries, apple compote and much, much more. Looking for more of a lunch? Get the barley risotto with green peas and local cheese, a Congee with rice or a Groddeller. They have several locations, but the Torvehallerne and Jægersborggade ones are the real deal.